The school field at Gulf Harbour School is about to become a field of dreams for anyone keen to improve their bicycle skills. The school is implementing the Bikes in Schools programme aimed at getting kids riding to both promote increased physical activity, as well as A donation from Harcourts Tandem Realty Ltd, through the Harcourts Foundation will go toward building a track around the school field, as well as a pump track, helmets and bikes. Gulf Harbour School deputy principal Mel Crosbie says once completed the cycle track will become an asset for the whole local community. “The roads around Gulf Harbour are so busy our students don’t often ride to school, this will give them the opportunity to ride their bikes in safety – while improving their skills and increasing their levels of activity. And it will be available for the whole community to use, at the weekends and in the evenings as well. The programme will also include a repair and maintenance station so students can also learn to repair and maintain the cycles. It is expected to be completed by the end of 2016. 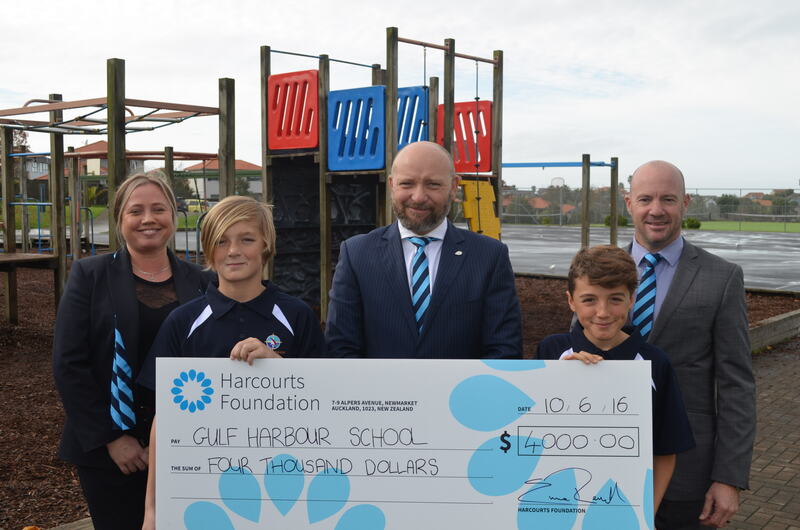 Harcourts Tandem Realty Ltd director Nick Langdon says it is extremely satisfying to be able to see Harcourts Foundation grants going to directly help the local community. Harcourts Foundation Ambassador Emma Revell says no matter what the cause, the Harcourts Foundation provides support to hundreds of organisations, enriching the lives of thousands of people in our communities.